So, I’ve decided that I’m going to start posting out weekly roundups with a little blurb about our currently featured story and author on Protagonize. In addition, we’ll list a few of the more interesting / noteworthy stories to check out this week, as well as a preview of what we have in store for you in terms of site updates for the week. Eventually, this will turn into some kind of full-fledged weekly email newsletter, but for the time being it’s just a blog post and a fan update on Facebook. This week’s featured author is Jillian, who’s been very active this week, having posted 3 stories and 16 branches as of this writing. With over 20 ratings, her stories are averaging a very strong rating of 4.7 (out of 5) overall. We actually have a pretty major new feature to announce this week. It’s not one of the flashier features on the site to-date, but it’s definitely useful to everyone and something I’ve been trying to get done for a while now.The feature we’ve introduced this week is email notifications. Yes, more spam. :) However, we believe that this should be quite handy to authors on Protagonize, and fully configurable. By default, all current and new users will be notified of follow-up posts on their stories and branches, comments on their posts and profile page, and if someone happens to add your as a favourite author. 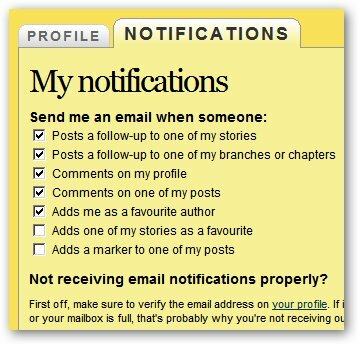 In addition, you can also enable notifications if someone adds one of your stories as a favourite, or adds a page marker to one of your posts. Every type of notification that I’ve just mentioned is configurable on your user profile — just load up the site, go to your profile and hit “Edit my profile“. You’ll notice a new “Notifications” tab there. Go ahead and take a look, and configure it to suit your preferences. I think that this feature will be quite useful as prior to having notifications, it was hard to keep track of updates to your own stories, or comments from other authors. Now, if someone drops you a note on the site, you’ll see it very quickly. If anyone has any concerns with this, please feel free to contact me. I’ve tried to make it as open and customizable as possible so that people who don’t want to receive any email can opt out completely, and people who want to be notified of every little happening can do so to their heart’s content. Well, that’s it for this first Protagonize roundup. I’ll probably be pushing this out as an email newsletter every Monday at some point in the near future, but since you guys are my test audience for now, any feedback is appreciated! In the meantime, please spread the word about Protagonize (hit that “share” link on our Facebook product page and get your friends to sign up! ), and be sure sign up on the site and subscribe to our blog at http://blog.protagonize.com — thanks! This entry was posted in Features, General, Press, Site updates, weekly roundup and tagged Features, killerstartups, notifications, Press, protagonize, readwriteweb, weekly roundup. Bookmark the permalink.